This was the first year without Cristiano Ronaldo in a very long time for Manchester United, but they managed to maintain their high level of play and reach their 3rd final in 4 years. Similar to their game in 2008-09, United was pressuring high up the pitch and with high intensity early on to hopefully win the ball off of Barcelona and score a quick transition goal. Chicharito had a balancing role to the attack where he frequently vacated the center and moved towards the flanks to provide an outlet and move the team up the pitch (while also looking to get in behind the fullbacks of Barcelona). Rooney did similarly as he always moved towards the ball and sought to combine while the winger on the near side would make runs inside – a frequent pattern of attack during the game was when Chicharito laid the ball off to Rooney near the left flank and Ji Sung Park made a run inside (while far side players made runs forward as well) and Rooney sought to play long diagonals in behind the Barcelona defensive line – which has always been a common strategy of SAF. 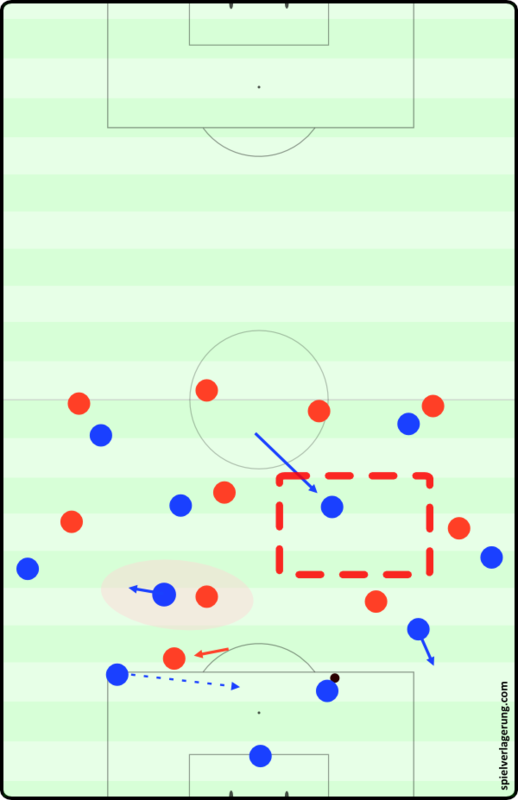 United actively sought to play long diagonals towards the flanks while the fullbacks overlapped and the forwards supported the ball in order to break through from there. During their high pressing Chicharito would mark one of the central defenders while Rooney sought to block passes into Busquets while pressuring the remaining central defender (at least in the beginning, later he just followed Sergio). Carrick and Giggs man-marked Xavi and Iniesta while the wingers matched up with the fullbacks of Barcelona. Due to their high number of forward players their counterpressing in the early stages once they lost the ball higher up the field was forcing Barcelona back further or winning the ball for a quick combination to shoot on goal. A structure which disrupted United’s pressing was when Sergio would move towards the far side halfspace to drag Rooney away from the central defender which Chicharito wasn’t marking and Xavi simultaneously dropped into the defensive line to drag Giggs (in the second half Park switched positions with Giggs and did the same) into the Manchester forward line where either Xavi or the central defender could progress the ball against Giggs. This frequently forced United into a 4-3-2-1/4-3-1-2 type shape. This obviously left more space in the midfield line of United where Messi could move into with his False 9 role (normally more towards the right as he likes dribbling diagonally inside with his left) to combine and penetrate the United shape. With the structural flaw in the Red Devils’ high pressing scheme they were forced to run up and down the pitch more often than they would’ve liked, leading to their collective intensity inevitably dropping during their high pressing – which was expected, but it might’ve dropped even earlier than they would’ve liked against a team which is difficult to press in Barcelona. Once Barcelona was able to pass the ball up the field and gain space to force United deeper in order to protect their own goal, Manchester had a difficult time when pressing the center of the field. Rooney was man-marking Busquets while Chicharito had to deal with both Mascherano and Piquenbauer. Messi would drop into the midfield and vacate his central forward position to play mainly in the right halfspace while Iniesta was in the left halfspace and Xavi was more central – though they frequently rotated during combinations such as lay-offs or take-overs. This was difficult to pressure because United simply wasted their 2 forward players on situational man-marking resulting in a free central defender moving up the field into a midfield which already has Messi dropping in the overload – which is how he scored his goal. United’s wingers focused mainly on the Barcelona fullbacks rather than the space around the ball so they couldn’t properly defend Barcelona’s numerical advantage through space-control. United’s two central midfielders struggled to cover the space in central midfield on their own and this resulted in many passes into Villa (who often moved into the center while Alves moved higher) who could lay it off for combinations to the line-breaking runs of his teammates. Vidic or Ferdinand would situationally fill the open hole in the United central midfield if Messi would drop deep in order to maintain some stability. This would result in United’s pressing looking situationally like a 3-4-2-1! Evra would do this at times as well because Park would follow Alves high up the flank and Villa would situationally drop into the central midfield. If Park tried to tuck inside from the wing then one of the Barcelona central midfielders would play a long diagonal into Alves who did a good job using his dribbling to move inside and combine with Messi (Lionel frequently uses him as support in very fast wall passing and rotation of position). In regards to their high pressing out of defense we were accustomed to under Josep Guardiola, they pressed out of their 4-3-3 shape the way they usually did – Messi would press one of the central defenders who would then pass to the opposite central defender, depending on which side Messi was on (usually the right) the opposite 8 of Barcelona would join the first line of pressing. Iniesta most frequently joined Messi when pressing the central defenders into long passes while Villa and Pedro pressed the fullbacks and Xavi moved towards the center and Busquets remained deeper. This created a staggered 4-4-2 pressing structure which was quite stable and worked very often to force United into long balls to lose the ball (although some of the long passes into Rooney and Chicharito against the 2 Barcelona center backs were quite dangerous). After about the 20 minute mark United lost their initial intensity in the counter attack and were therefore much easier to counterpress for Barcelona resulting in a higher control of the Manchester offensive transitions. This was also made easier due to the fact that Barcelona frequently moved towards a 3-4-3 type shape with Abidal shifting inside and Alves moving up the right flank – resulting in higher numbers up the pitch for the pressing after they lose the ball. Alves moving higher and Villa towards the central defenders helped occupy them and forced them to stop covering their central midfielders when Messi would overload the center of the field. Around the 30 minute mark Rooney began leaving Busquets more often to press and help United maintain a 4-4-2 structure. Funny enough, this is when United had a good spell of pressing sequences in midfield and even forced the throw-in which they scored off of – Rooney wall passed past Busquets and dribbled into the center of the field before combining with a Giggs lay-off to score. After the goal he immediately returned to man-marking Busquets and finished out the game in that fashion, which led to Barcelona dominating the rest of the game. This game was nearly 5 years ago! …Time flies. The 2011 final is one of my favorite games through football’s 100+ year old history as it was Guardiola’s strongest team (which many consider the best team ever) playing some of their best football in a European club final against the legendary Sir Alex Ferguson and his Manchester United. The emergence of Messi in the False 9 role and Barcelona’s positional possession game is what defined both this game and this era in Barcelona’s history. I hope you all enjoyed this “retro analysis” and have a Merry Christmas!